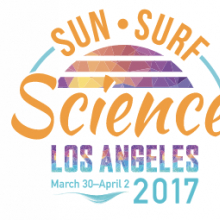 This Education Week blog article describes a dearth of curricula that are aligned to the NGSS standards. 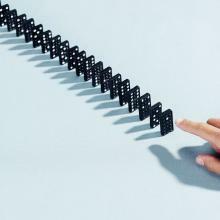 Notably, it points out the need for PD side by side with new curricula, "Previous efforts to produce science materials for teachers often yielded great results— but neglected professional development. 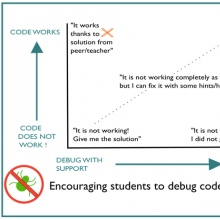 The developers of new curricula need to see these as intertwined, rather than separate, Short said, with supports built in so teachers feel safe trying out new things." Where Does Plastic End Up? Here's a video of the interview with our colleague Cristián Rizzi (the interview starts around 00:05:30). 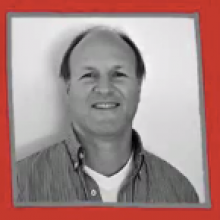 Cristián translated the Project GUTS MOOC and many resources into Spanish. 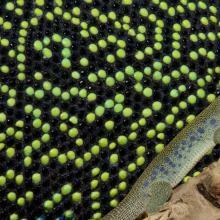 He talks about new developments in modeling and simulation that excite him. In this video, Dr. Susan Yoon of University of Pennsylvania talks about science education, modeling and simulation, and gives a delightful historical perspective on her involvement with StarLogo Nova. 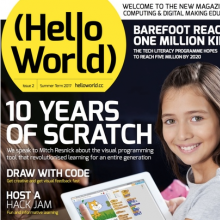 Here's a new online magazine called "Hello World" from the UK's Raspberry Pi, Computing At School and BCS Academy,with support from British Telecom. Peter Denning weighs in on the current state of Computational Thinking. He attempts to answer three questions: What is Computational Thinking? 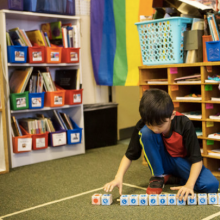 How do we measure students' computational abilities? and Is computational thinking good for everyone? This is a good read and thoughtful presentation of the topic. 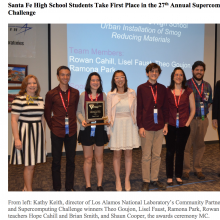 Photo (from left): Kathy Keith, director of Los Alamos National Laboratory’s Community Partnerships Office and Supercomputing Challenge winners Theo Goujon, Lisel Faust, Ramona Park, Rowan Cahill (GUTS alumni), and their teachers Hope Cahill (former GUTS club leader) and Brian Smith, and Shaun Cooper, the awards ceremony MC. 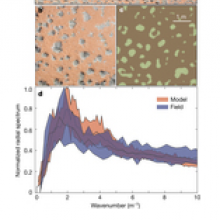 In an article from phys.org, researchers have used simulation to show that skin color in animals arise from microscopic interactions between neighboring cells. 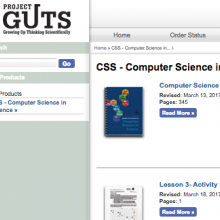 Project GUTS was highlighted in a new article on Computational Thinking in Teacher Education. The authors, Aman Yadav, Chris Stephenson, and Hai Hong, state "One example of embedding computational thinking in science classrooms is Project GUTS (Growing Up Thinking Scientifically), which highlights what computational thinking looks like for students using three domains: modeling and simulation, robotics, and game design. John Sweeney, an 8th grade teacher at St. Francis of Assisi Catholic School in Cordova, Tennessee, wrote to tell us he will be giving a presentation on Project GUTS at the NSTA national conference in Los Angeles next week! We have opened a new Marketplace where teachers, school districts, and other Project GUTS PD providers can purchase our printed CS in Science curriculum binders and StarLogo Nova block cards on demand. 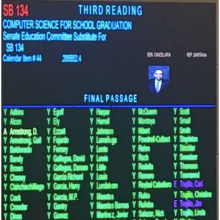 We are using Mimeo as the provider as we have found their print on demand service to be exemplary. Mimeo can work with districts and schools to set up invoicing via PO or can accept payment directly using a credit card. 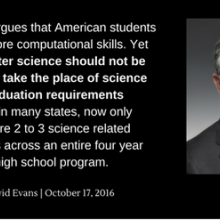 NSTA Executive Director, David Evans, while an advocate for CS education does not believe computer science should be able to count as a science graduation credit. In the NSTA community blog (http://nstacommunities.org/blog/2016/10/17/computer-science-should-supplement-not-supplant-science-education/) of October 17th he stated his view that "Computer Science Should Supplement, not Supplant Science Education."